The All-New BMW X4. Challenge Accepted. 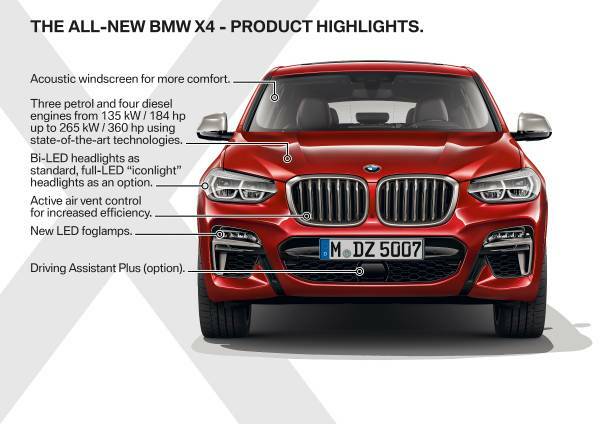 The all-new BMW X4 makes its mark by delivering individuality, dynamism and innovation in far greater doses. It is here to write the next chapter in the success story of the first ever Sports Activity Coupe at the premium end of the mid-size class. 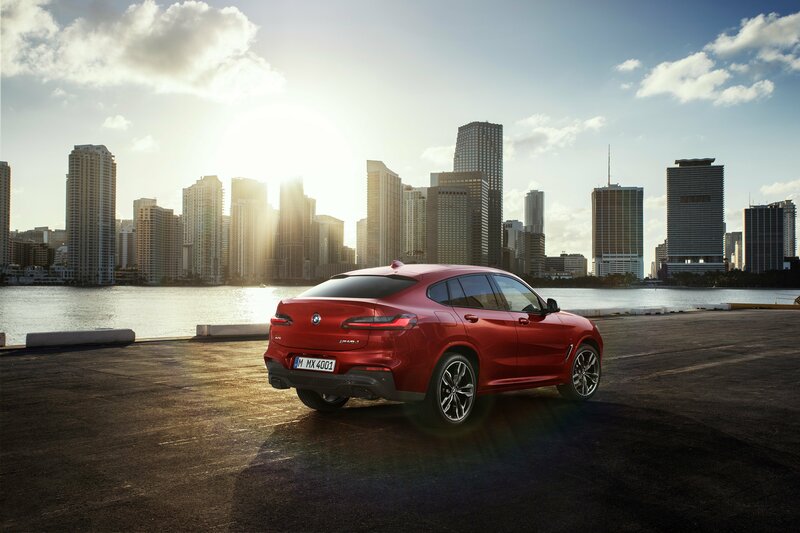 Not only does it bring about a distinctive and muscular exterior design, the X4 packs coupe performance. With its M Performance TwinPower Turbo inline 6-cynlinder engine, the BMW X4 M40i is engineered to leave them speechless with its best-in-class acceleration. 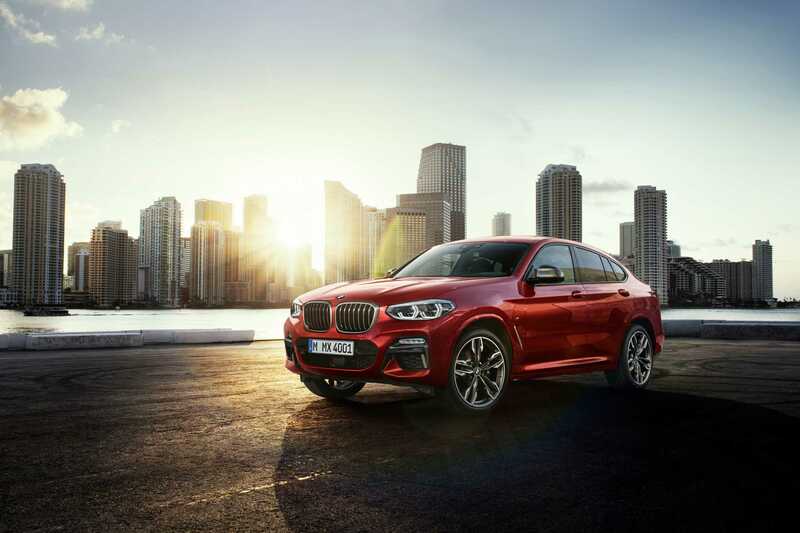 The BMW X4 is 3-inches longer, 1.4-inches wider and 0.1-inch lower than the predecessor and its wheelbase has been lengthened by 2.1-inches- increasing stability, grip, and handling! 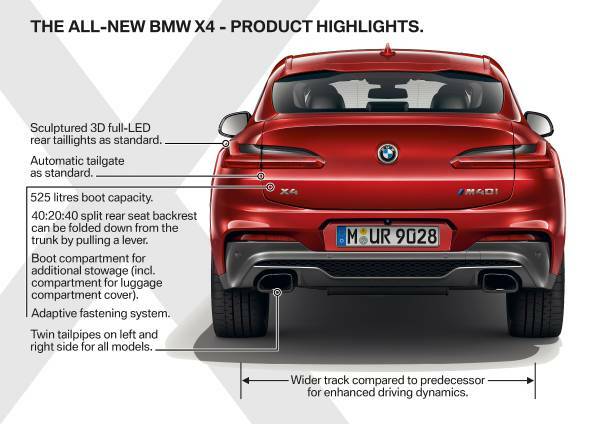 Not to mention, the all-new X4 has also been given a nearly perfect 50/50 weight distribution, front-to-rear. Impressive! Enjoy ‘Three-Dimensional Shaping’ and striking geometry in the rear featuring slightly slimmer and wider LED lights. Also built into the rear deck is a large spoiler- which emphasizes the sportiness of the BMW X4. Moving into the cabin, you can really tell the X4 has been inspired by sports coupe models. 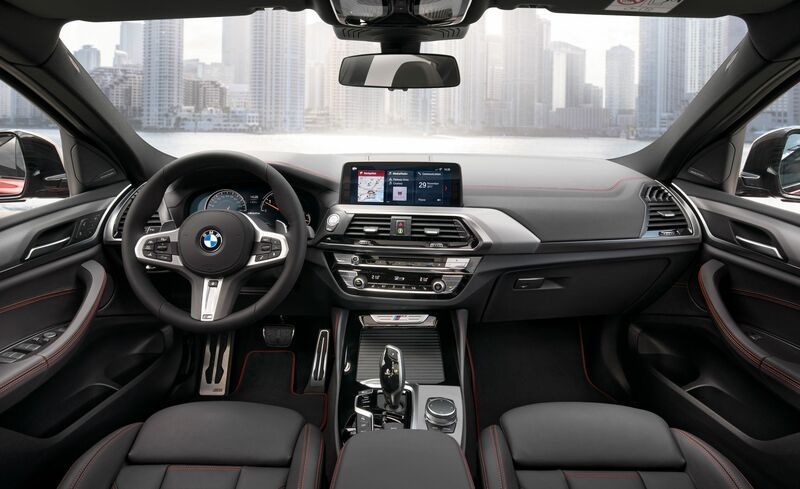 Featuring a low seating position and optional 10-way power adjustable front sport seats (part of the M Sport Package), this is unlike any Sports Activity Vehicle you have gotten into. The All-New BMW X4 is a Sports Activity Coupe that makes an impact every time, and anywhere. The combination of aggression and agility, sportiness and grace lets the BMW X4 conquer all challenges with ease – while driver and passengers ride in unequalled comfort. Get excited.